It’s impossible to change the past; to change the future can be even harder. Physically, death is certain; spiritually, certainty is death. A minister is something of a jack-of-all-trades – without the skills. Yes, “put on the Lord Jesus Christ” (Romans 13:14; cf. Galatians 3:27). Just don’t expect him to fit, being at once too large and too tight for comfort. How can anyone read the Bible without a deep and dreadful sense of discombobulation? I’m afraid you’ll have to ask an inerrantist. The Bible is like the Great Boyg in Ibsen’s Peer Gynt – a wild, sprawling, inscrutable, immovable, monster – except that the Boyg, unlike the Bible, finally capitulates. As ministers merely lead worship, on retirement I was looking forward to actually worshipping. The transition, however, has not been easy. I still often feel like a liturgical inspector and homiletical critic. So-so sermons I expected, but who’d have thought you could screw up a eucharist? Hey- ho, I suspect that even in heaven I’ll be fidgeting in my seat, harrumphing at the elders and angels, and checking my watch, waiting for the service to end. Except that it won’t, will it? Still, for music, at least, there’ll be Handel, not (Lord, have mercy!) Hillsong. Faith can be a wonderful blessing, and a terrible burden; something to be enjoyed, and something to be endured. Alas, some churches are like banks: in profit you are good for business, but in loss you are bad for morale in their lament-free zones. Whenever I turn to Augustine’s Confessions, I always feel slightly embarrassed – an appropriate disposition, I think, for what is, after all, a love letter. What was God doing before he created the world? Yes, “preparing Hell for people who pry into mysteries” is a “frivolous retort”; rather, as Augustine continues, the question itself is unintelligible, based on the failure to realise that time, with its before and after, only comes into existence with creation (Confessions, XI, 12-13). Which is true, but prevaricating. Look at the world: it’s a shambles. What was God doing before he created the world? Surely getting drunk. Which reminds me … My dad was an eminent architect, a VIP in the Raymond Loewy Corporation, specialising in department stores. He would often take clients to lunch, including liquid, of course, which for my father meant a very dry gin martini – or two … Then back to the drafting board. Which leads me to advise: check your life insurance policy before shopping at Lord and Taylor. And now baseball players in camouflage jerseys: “You will see ‘The Awful Horror’ standing in the place where he should not be” (Mark 13:14). Truly, “The ceremony of innocence is drowned” (Yeats, “The Second Coming”). Speaking of soldiers … If it is trained like a soldier, dresses like a soldier, fights wars (on crime, drugs, etc.) like a soldier, and then pisses on protest like a soldier, it’s probably a soldier. As for any charm offensive by the Ministry of Truth on the militarization of so-called “peace” officers, it’s like – what’s the expression? – “putting lipstick on a pig”. Still on point: it’s good to see American police forces honouring their European roots – as municipal armies of nascent, born-to-kill nation-states. Fox News is not the channel of hate and lies, it is the channel of capital – but nothing sells like hate and lies. Is the salvation of Fox News in doubt? Of course not: its damnation is certain. What is the visible essence of sin? Violence. The first biblical narrative set in our world is the story of violence, murder. What is the visible essence of sinlessness? Nonviolence. The sinlessness of Jesus is evident precisely in the narrative of his nonviolence, culminating in his murder. Interestingly, sinlessness and nonviolence are both negatives, elements (you might say) of an apophatic Christology. “The Lord God said to Abram, ‘Leave your country, your relatives, and your father’s home, and go to a land that I am going to show you. I will give you many descendants, and they will become a great nation. I will bless you and make your name famous, so that you will be a blessing.’ And Abram said, ‘Sounds like a plan.’ And the Lord God said, ‘Plan C, actually, Abe. And if it doesn’t work out, meh: the alphabet is very long’” (Genesis 12:1ff., Original Autograph). Speaking of plans … You know the old saying, “What makes God laugh? Tell him your plans”? Well, you know what makes me laugh? God telling us his plans. I mean, you gotta be kidding. The results of fashionable facial cosmetic surgery – I know I’ve seen that look somewhere before … That’s it! 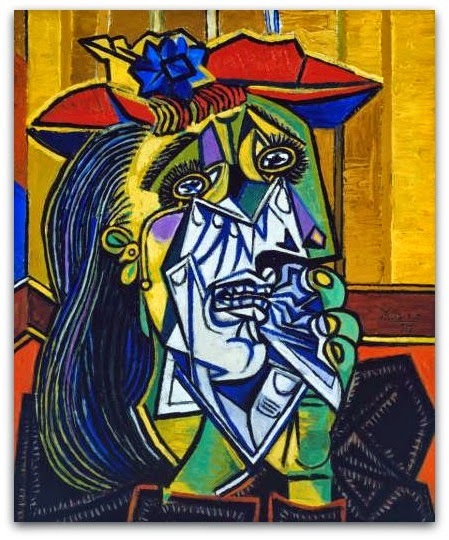 – some of Picasso’s cubist portraits, say, The Weeping Woman. Aesthetic refigurement reiterated as plastic disfigurement. So a 9-year-old girl accidently kills her shooting instructor while being shown how to fire an Uzi. I guess either the complementarians are right – bullets for boys, Barbies for girls – or we’ve got to start teaching all our kids how to use assault weapons by the age of 6. A masked executioner – he is horrifying and detestable. That is why, in our mind’s eye, we must unmask him, envisage him, lest fear and hatred overwhelm us, and in demonising him we dehumanise ourselves and add to the wreckage of atrocity.